La Nativité du Seigneur (The Nativity of the Lord or The Birth of the Saviour) is a work for organ, written by the French composer Olivier Messiaen in 1935. La Nativité du Seigneur is a testament to Messiaen’s Christian faith, being divided into nine “meditations” inspired by the birth of Jesus. In volume one, Messiaen outlines his inspirations, both theological, instrumental and compositional. As the composer notes in his preface, he sought “the emotion and sincerity first”. The work was written by the composer at the age of 27 years during the summer of 1935 while he was in residence at Grenoble near the French Alps. Messiaen wrote that in addition to theology, the movements were inspired by the mountains, as well as the stained glass windows in medieval cathedrals. 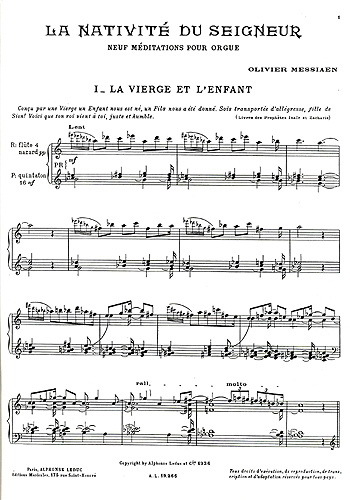 The work was premiered on 27 February 1936 on the organ of La Trinité, Paris, shared among three players: Daniel-Lesur (1–3), Jean Langlais (4–6), and Jean-Jacques Grunenwald (7–9). The work is in nine movements, each depicting an image or concept from the birth of Jesus. In publication, the work is divided over four books. The work is one of the earliest to feature elements that were to become key to Messiaen’s later compositions, such as the extensive use of the composer’s own modes of limited transposition, as well as influence from birdsong, and the meters and rhythms of Ancient Greek and traditional Indian music.